For the unimaginative and lazy, a common refrain is that there is “nothing to do in Dhaka.” Residents of this metropolis believe that they have either done it all, or there isn't enough time to do anything. While the former may not be true for everyone, they might be partly right about the latter, what with traffic jams making it impossible to navigate the roads, and eating into the few hours you might have for yourself after school/work. To have fun in Dhaka, you must have time on your hands, use the weekends, or maybe even take a few days off to really see the city and all it has to offer. Let's start with sightseeing. Being Dhakaites, we spend most of our time on the roads, but that really doesn't mean you've actually seen the city. If you put yourself in a tourist's shoes, there are many historic, cultural and architectural wonders to take in and the experience is guaranteed to be anything but ordinary. The Jatiyo Sangshad Bhaban, or the National Assembly Building of Bangladesh, is a good place to start. Created by architect Louis I Kahn, this building is one of the largest legislative complexes in the world. This concrete architectural beauty, consisting of intricately linked corridors, staircases, large columns, hollows and light courts, occupies 200 acres of land. Lush green landscape lies on one-side and water bodies on the other three, representing the riverine beauty of Bangladesh. The construction of this building began in 1961 and was completed in 1982. The complex includes residences for the Members of the Parliament (MPs) and the Prime Minister's official residence is a mere five-minute walk away. The Shahid Minar, a monument to commemorate the language martyrs. Popular for jogging and skating, and for early morning and evening strolls, this complex is also used for picnics and as a hangout spot for youngsters. The complex is situated in Sher-e-Bangla Nagar and is accessible from Lake Road, Rokeya Sarani, Manik Mia Avenue; and Mirpur Road. Winner of the Aga Khan Award for Architecture in 1989, this magnificent architectural specimen is worth a visit. Your tour of Dhaka can continue with a visit to the Shaheed Minar, a national monument built to commemorate those who lost their lives during the Language Movement of 1952. If you are Bangladeshi and a resident of this country, you have made at least one trip to the Shaheed Minar possibly on the 21st of February, to show your respects to the dozens of students and political activists brutally murdered by the Pakistani police force, during a demonstration demanding the right to establish Bangla as a state language. The very first Shaheed Minar was constructed overnight after this incident, by students of Dhaka University and other educational institutes and stood erect by the 23rd of February. However, The Pakistani police force destroyed this, three days later. This monument was constructed on a grander scale, completed in 1963, by artists Hamidur Rahman and Novera Ahmed, with marble floors, magnificent columns, fountains, intricate railings carved with Bengali alphabets and many other symbolic touches, but this too was damaged by the Pakistani military during the Bangladeshi Liberation War of 1971. The grand Lalbagh Fort is impressive even in its incomplete state. 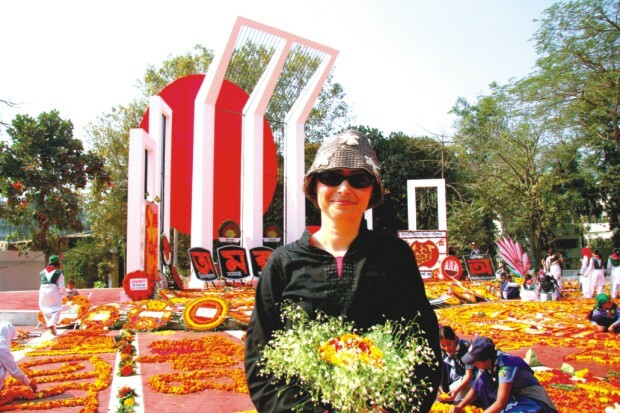 The current Shaheed Minar, located on Fuller Road, is constructed with columns of pure white marble, on a stage, which is about 14 feet high. The fence on either side has verses from famous poems upon them-- the letters carved from iron. The stairs leading up to the monument and the fence are painted white to create a heavenly effect. Bangladeshi or not, you can't help but feel a sense of pride as you feast your eyes upon this monument which reminds us of the sacrifice of these Bengalis made for their mother tongue. It is also a symbol for all mother tongues, February 21st being International Mother Language Day. While you're in the area, you might consider taking a closer look at the familiar Dhaka University campus-- you might just notice a few things you hadn't before when you were in a hurry. Popularly known as “the Oxford of the East,” this university was established back in 1921. With a student body of 32,000, the campus is naturally large and also well spread out, and houses the best examples of Dhaka's original architecture, which is a mix of Mughal and European work. The Curzon Hall, Shahidullah Hall, Salimullah Hall, Fazlul Hall and Madhur Canteen are a few among many others which are definitely worth a visit. The 400 year-old Dhakeshwari Temple in Lalbagh. 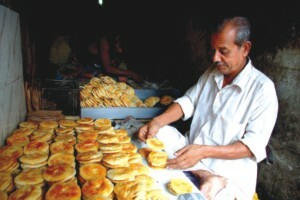 Melt-in-your-mouth bakharkhani, a popular, age-old tradition of Old Dhaka. Apart from the old, beautiful structural design, there are various monuments and sculptures scattered around the campus depicting the Language Movement and Liberation War of Bangladesh and famous personalities including writers, poets and singers. The Faculty of Fine Arts, known as Charukola, is also a place you might want to take a look at. This department produces the best artists (sculptors, painters, designers etc) in the country, whose works are displayed all around campus. Cultural and seasonal festivities on this campus are definitely something you would not want to miss. Speaking of cultural festivities, there is one location in Dhaka, where an important festival is celebrated. Pahela Boishakh or the Bengali New Year is incomplete without an early morning cultural programme and paanta bhaat (watery rice) at the Ramna Park, a large recreational park located at the heart of Dhaka city. 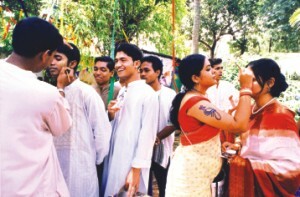 Colourfully dressed crowds gather under the shade of the large banyan trees at this park to partake in the celebrations. The Ramna holds various species of beautiful flowering, fruit and other plants, and a lake, which adds to its aesthetic beauty, making it a fun and relaxing venue to visit, all year round. To the southwest of Salimullah Hall of Dhaka University lies the famous Dhakeshwari National Temple, Dhakeshwari being, the goddess of Dhaka. 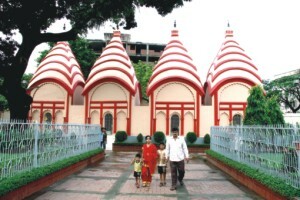 This temple holds the status of the most important Hindu place of worship in Bangladesh. This temple was built in the 12th century by a king of the Sena dynasty, known as Ballal Sen, and many say the city was actually named after this temple. Although years of damage and repair has completely changed the original design of this temple, the yellow and red structures housing beautiful gods and goddesses still has an wisened look about it, which adds to its charm. The temple is an important part of Dhaka's cultural heritage. For those of you who like historical monuments enough to travel a little bit outside the city, The Jatiyo Sriti Shoudho or National Martyr's Memorial designed by Syed Mainul Hossain is a must see. This monument is the symbol of the bravery and sacrifice made by those killed in the Liberation War of 71. Located in Savar, about 35 km north-west of the capital, this majestic structure lies spread out over 84 acres of land. The monument is about 150 ft tall. The main building is made of concrete while the area that surrounds it is laid out in red bricks, making a startling contrast. An artificial lake, and several mass graves lie in front of this structure, adding to its gravity. 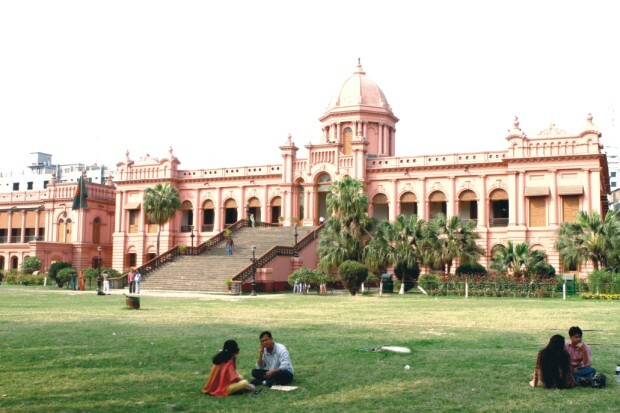 Ahsan Manzil, the pink palace with its beautiful grounds is a popular hangout spot. 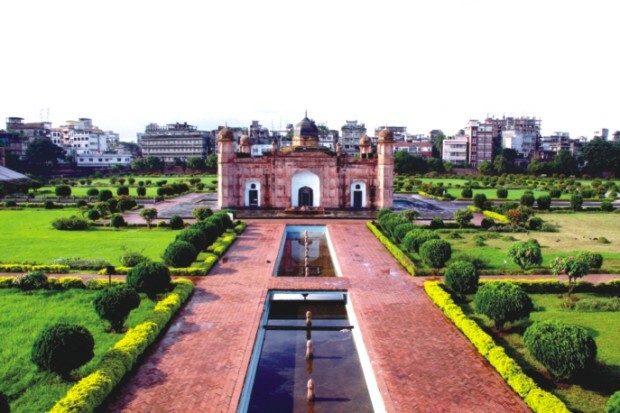 When you are back in the city, take a look at the National Museum, which you must have passed thousands of times while travelling through Shahbagh. This museum, inaugurated in 1913, not only holds historical artifacts, artwork, books and documents dated back to the 1900's, it also shows glimpses of the rural and tribal lives of Bangladeshi people, and displays their culture proudly. The Liberation War Museum in Segunbagicha also displays historical relics and documents and records, dated back to the British Raj in Bengal and the War of 71 and is an extremely valuable source of information regarding our country. If you want to go further back in history, Old Dhaka is the place you want to see. Home to Haji'r Biriyani , mouth-watering bakarkhani (a melt-in-your-mouth cracker-like bread) , Mama Halim (a delicacy made of pulses and meat) and borhani (a spicy yoghurt drink) to die for, one visit to this place will make a true Dhakaite out of you. As you weave your way through the narrow old town roads, you will be greeted by friendly faces and delicious smells wafting from roadside restaurants selling biriyani (rice pilaf with beef/checken/ mutton) and sweets around every corner. Once you are in old town there are a few places you have to stop by, such as the Lalbagh fort–a fortress from the Mughal era, near the Buriganga River,which remain incomplete to date. The construction of the fort was started in 1678 by Prince Muhammad Azam when he was the vice-royalty of Bengal, but was put to a halt when he was recalled by Aurangzeb, his successor. The red brick fort is impressive even in its incomplete state and consists of the tomb of a Mughal princess, a mosque and several rooms for the viceroy's court (Diwan-e-Aam). Also along the banks of Buriganga, lies Ahsan Manzil, or the pink palace, the official residential palace of the Dhaka Nawab family constructed in 1872. The palace enjoyed an interesting history and served not only as a home to a Mughal landlord, but also as a French trading centre before the Nawab family moved in. It now serves as the Bangladesh Nationa Museum.With it's beautiful grounds, it is a popular hangout spot for both tourists and old Dhaka residents. 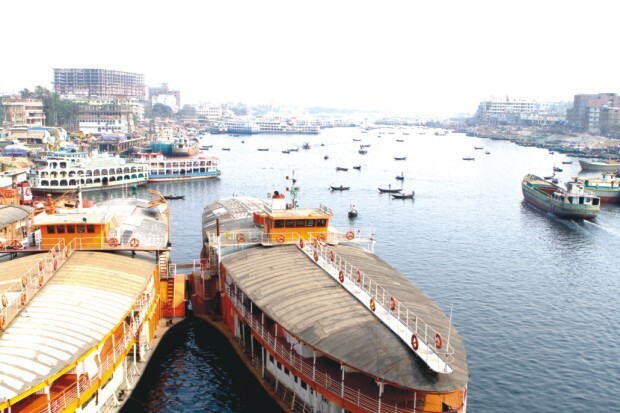 A cruise on the Buriganga River takes you away from the hustle and bustle of the city. While you are still in the area, look for Northbrooke Hall, where you will find a building, which is almost 200 years old, reflecting architectural styles of the Mughals with some European touches. The Beauty Boarding house is a part of this structure, where leading intellectuals of the country once used to gather to discuss literary pursuits and ambitions. The yellow walls of the boarding house have been freshly painted, but the old, crumbling building around it adds to the ambience of an important historical site. 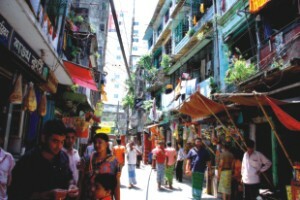 A street on Shankhari Bazar, a 400 year-old neighbourhood in Old Dhaka. When you are done taking a look around Beauty Boarding and have tried some of their traditional Bengali cuisine of fish and rice, take a walk to Shankhari Bazar, a 400-year-old neighbourhood and market place, only a block away from the Buriganga. With its unique collection of artwork, craftsmanship and colourful fabric, Shankhari Bazaar is the perfect place to absorb the Old Dhaka feel. The narrow lane is flanked by richly decorated buildings on either side, built during the late Mughal and Colonial period. Loud music, the sound of the dhol (drums), pictures of Hindu deities and loud cheerful chatter will greet you as you walk through Shakhari Bazaar, home to a hub of Dhaka's Hindu community. Another place to find a variety of fabrics is Islampur road, where the largest fabric wholesale market in the country is located. The old town roads will lead you through this vibrant shopping zone where every colour, design and texture can be found when it comes to fabric. Whether it's fabric to decorate your home or decorate your person, you'll find it here. This fabric lover's paradise is definitely worth taking a peek at. Once you are done shopping, eating and taking in the Old Dhaka atmosphere, take a break and rest for while, on a boat ride at Sadarghat, one of the largest river ports in the world. The hundreds of large motorised boats are for passengers and merchandise, travelling to and from the city. The smaller dingy (traditional wooden boats) can be rented for an hour or so for a mere 120 Takas to float around the Buriganga and enjoy the view and if you are lucky, the vocal styling of your boatsman. 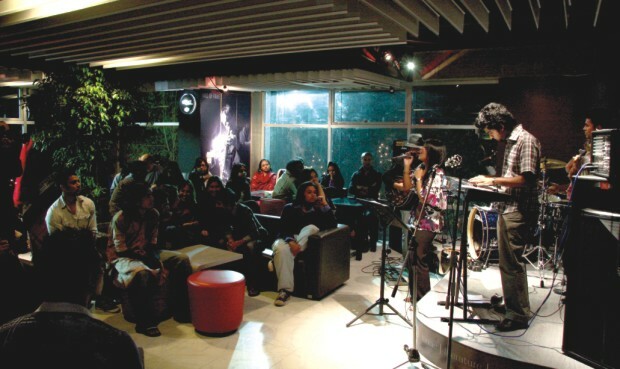 Live music and recitals are crowd pullers at Kozmo Lounge in Banani. All your sightseeing will definitely take a while so if you are a resident, you might want to spread it out over a few weekends, so you can see everything worth seeing at a relaxed pace. But you're not done with the city, unless you've been out shopping. Shopping at this metropolis is again, quite time consuming, but if you know where to go, you can find almost anything under the sun. The city has shopping malls sprouting around every corner, offering you clothes, both traditional and western, shoes, cosmetics, accessories, jewellery, electronics, decorative items, furniture-you name it. If you are looking for purely traditional, ethnic products, Aarong, Jatra, Aranya, the Mirpur sari district, and Tangail Sari Kutir are some places to start with. Aarong currently has six outlets all around Dhaka city, the largest ones located in Gulshan 1 and Bangabhaban. Dining Japanese cuisine at Izumi in Gulshan. Aarong in Bengali means "a village fair," and the fair-like atmosphere of the store invites you in with its beautiful nakshikanthas (stitch work), clay and brass decorations, traditional yet trendy saris, jewellery, leather goods and much more. Jatra is a similar chain of retail outlets, which offers trendy indigenous products ranging from clothes to household decorative items such as lamps and jewellery to traditional folk music. Jatra can be found in Banani and Dhanmondi, and if you are lucky you can catch some live folk music at the stores while you shop. Aranya has an outlet in Banani, in the same building in Jatra and has a large collection of clothing items made from natural dyes. The traditional Bangladeshi jamdani saris made from muslin with intricate threadwork can also be found in this shop. Traditional saris can also be located in the Kumudini (Gulshan and Dhanmondi), Mirpur sari district and Tangail Sari Kuti on Baily road, where a variety of homemade silks, kathans and jamdanis are available. Chilling out at X Lounge. For slightly cheaper, yet traditional products, you might want to visit New Market (North of Azimpur), Chandni Chawk and Hawker's/Gawsia Market (Balaka Bhaban) and the Elephant road shopping district, where a variety of clothing, fabrics, shoes, books, jewellery, music and household items can be found, at bargain prices. New Market, was constructed in the 50's and is also an integral part of the Dhaka culture, so even if you aren't a shopper, a stroll down its lanes will be worth your while just to take a look around and take in the atmosphere. 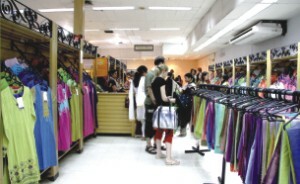 The larger shopping complexes and outlets, offering contemporary fashions and electronics include Bashundhara City (Panthapath), the largest shopping mall in South Asia complete with 2500 retail outlets, an underground gymnansium, large food court, a multiplex style movie theatre and an indoor theme park. Pink City (Gulshan), Shopper's World (Gulshan), Rifles Square (Dhanmondi), Fahim's (Gulshan) Westecs (Gulshan), Text Mart (Gulshan and Dhanmondi), Genetic Plaza (Dhanmondi) and many more. These large shopping malls are also treasure troves for reasonably priced DVDs of movies from all over the world, every television show you can dream of and a huge collection of video games. For all computer related items, you have to make a trip to the IDB Bhaban in Agargaon, where there are various show rooms offering great deals, for laptops, LCD monitors, CPU's etc. 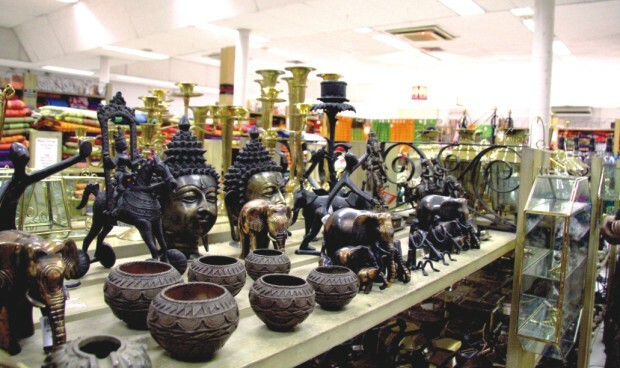 For antiques and other household items Gulshan 1 and 2 markets are ideal locations to visit. Young people find Floor 6 a good place to watch a game with friends. If you are a jewellery lover and are willing to spend a bit of money on quality pieces, you will want to go to The New Jarwa House (Gulshan Avenue), Venus Jewellers (Gulshan-1), Al-Amin Jewellers (Azampur), Classic Ornaments (Uttara), Shaptorshi (Dhamondi), Apan Jewellers (New Circular Road) among many others. Bengali festivals like Pahela Boishakh bring out the colours of joy and celebration. With your shopping bags full and your feet about to fall off from all that walking around, you might now want to have a seat, escape from the heat and humidity and feed your empty stomach. Food is one thing Dhaka has become an expert in over the years, and the wide variety of cuisines available can satisfy almost any desire for any palate from almost any place you can possibly think of. If you want traditional Bengali food, like bhaat (rice) bharta, vegetables, curries etc step into Kolapata (Adabor), Kosturi (Gulshan), Heritage (Gulshan), Star Kebab (Banani and Dhamondi) or Dhanshiri (Gulshan) a popular breakfast place for early risers. If you're in the mood for authentic Japanese cuisine, maybe a Shabu Shabu salad, you must try Izumi (Gulshan) which had it's opening a year ago and has enjoyed wonderful reviews thus far for it's food, decor and service. Samdado is also a popular Japanese restuarant, famous for it's mouth-watering sushi. If you're craving Italian, take yourself out to Spagetti Jazz or Bella Italia, both located in Gulshan, for a cheesy pizza Bolognese or pasta with meat sauce and don't forget the tiramisu for desert. 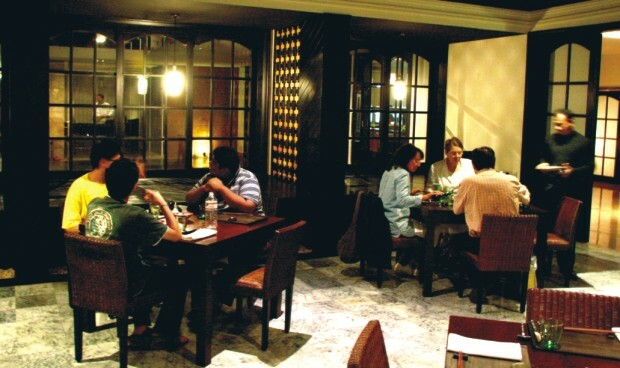 If Korean is what your heart (and stomach) desires, Arirang or maybe Sura, also located in the Gulshan area are the places to be. For good old Chinese, visit Mainland China, which has opened its first international outlet in Uttara or Cathay in Gulshan. If you're in the mood for enchiladas, tacos and burritos El Toro is the place to go, especially for the authentic Mexican ambience it offers. For Vietnamese cuisine, you may want to check out a new place in Gulshan known as Zaika, which opened up recently. For Turkish food visit Topkapi (Gulshan) and for Indian there is Khazana(Gulshan), Laziz (Uttara) and Santoor (Dhanmondi) which will provide you with all the biriyani and reshmi kebabs you can dream of. If you want Grecian food, Casa Greek is definitely worth a try and for Thai there is @ Corner and Soi 71 located in Gulshan. If you're in the mood for sea bass, honey barbequed tiger prawns and squid make you way to Saltz (Gulshan) and for steak there is Spitfire and Steakhouse (Gulshan). For American fastfood there is of course KFC (Gulshan, Dhanmondi and Banani) and Pizza Hut (Gulshan and Dhanmondi). Well those were a few of the hundreds of restuarants all over this city, but if you're just looking for a place to sit and enjoy some coffee, a drink or even sheesha, there are a variety of options available for you. 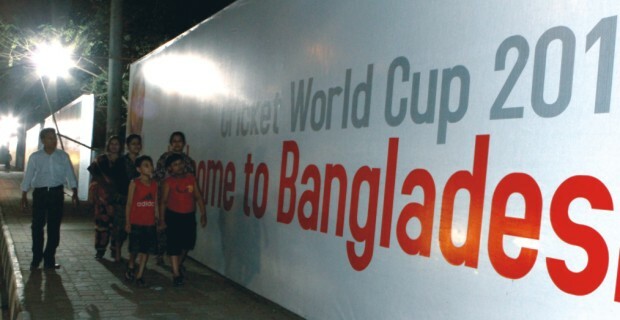 With the World Cup Series starting off in Dhaka, you might want to go somewhere with your friends to watch the games on a large screen if you don't have tickets for the stadium. In such cases, The Bench (Gulshan), Floor 6 (Banani), Mynt (Banani) , H20 (Dhanmondi and Banani) and X-Lounge (Gulshan) are places where you can kick back, smoke your sheesha and cheer your team on. Flavours Lounge has also opened up a sheesha lounge with a host of new flavours like black liquorice you may want to try out. Cafe Mango (Gulshan and Dhanmondi), Barista (Gulshan and Karwan Bazaar), Coffi 11 Roll Express (Banani), Mermaid Cafe (Baridhara) Kozmo Lounge (Dhanmondi and Banani), Fire and Ice (Uttara) are also places you can visit with your friends for coffee, all kinds of snacks and even live music. For dessert places, Bittersweet Cafe (Gulshan) has become a favourite and you can get a range of wonderful treats like chocolate soufflé, sticky toffee puddings, cheesecakes and chocolate peanut butter milkshakes. The California Bakery (Gulshan and Dhanmondi) is also a great place for cakes and cookies. For ice cream there is Swiss -made Movenpik (Gulshan) and Andersons (Gulshan and Dhanmondi) and if you want something richer like gelato, Club Gelato (Banani) is the best option as it also has a good range of cakes and pastries. 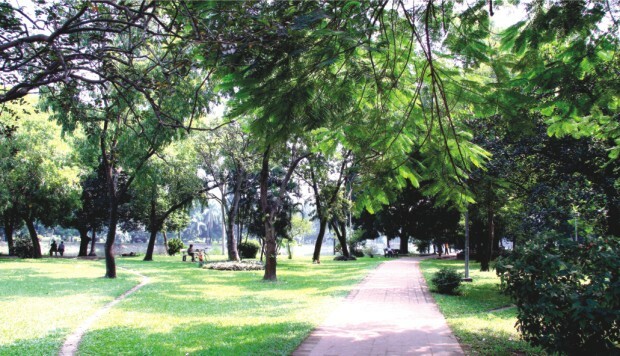 A stroll through Ramna Park is the perfect way to bring harmony and balance to the soul. While entertaining your stomach is always fun, there are also a few other activities you can enjoy around the city. If you don't feel like travelling all the way to old town, you can always go boating on Dhanmondi Lake on an evening when you find there is nothing else to do. If you enjoy bowling, there is the Fu-Wang Bowling Alley (Gulshan), which sometimes hosts concerts and the Thunderbolt bowling alley in Rifles Square (Dhanmondi). Another fun activity you can enjoy with your friends is paintballing, at Xtreme Paintball (Panthapath), which is basically a paintball fight. You can also go out for movies to Redshift (Gulshan), which screens new releases regularly, or the Star Cineplex in Bashundhara, which has really delicious popcorn. Dhaka also offers quite a number of art galleries such as Bengal Gallery, Shilpangan, Chitrak and Alliance Francaise in Dhanmondi, The Gallery in Gulshan and Gallery Kaya in Uttara. There are also shops selling art in Gulshan 2 Market. Around this time of the year, you can end your day with a walk or a drive around the city and enjoy the gorgeous lights decorating the roads for the World Cup, once the traffic thins out. While many places to go and things to do have been mentioned, it will take a lot more than a few pages to cover everything there is to see and do in this wonderful city. All you need is an open, relaxed mind, and time out of your busy schedule, to step back from your hectic life and just take a look around. So stop complaining and being lazy, make an effort–you might just have some fun.